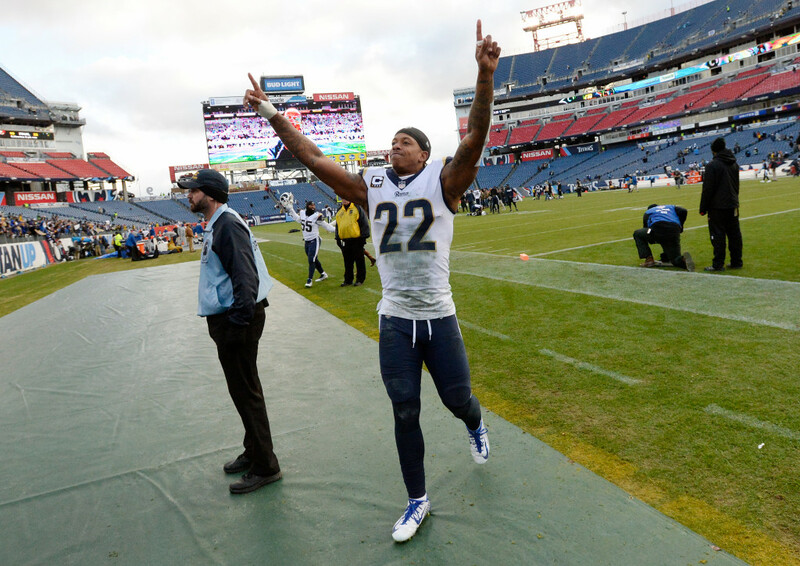 THOUSAND OAKS — Trumaine Johnson hopes this isn’t his only successful season with the Rams. Johnson, the Rams’ top cornerback, understands his six-season tenure with the Rams could be in its twilight, as he is set to become an unrestricted free agent when this season ends. A few months ago, Johnson seemed resigned to departing from the only NFL team for which he has played, and hinted that the Rams no longer seemed to want him. Now, with the Rams enjoying what is by far the best season of Johnson’s career, he seems to have some optimism about staying around. Either way, Johnson will be fine. He turns 28 on Monday and still should have some prime seasons left. Even if the Rams don’t re-sign Johnson, other teams will be happy to offer multi-year contracts to the lanky team captain who has 11 career interceptions and has been solid in coverage this season. There’s something more, though. Johnson is a native of Stockton and has enjoyed having family nearby, and he feels something for the Rams, who drafted him in the third round out of Montana in 2012. Johnson has yet to sign a second (negotiated) contract, though. His rookie deal expired after the 2016 season, and the Rams applied their franchise-player tag to him. They hoped to sign him to an extension then, but it didn’t happen, so Johnson was tagged for a second consecutive year. The NFL doesn’t allow for a player to be tagged in three consecutive years, so this is it for Johnson, who is the Rams’ highest-paid player this season at more than $16.7 million, thanks to the franchise tag. The saga took a twist at the end of training camp when teammates voted Johnson as one of their team captains for the first time in his career. At the time, Johnson’s “win games” mantra seemed like a throwaway line by a player who wanted to avoid questions. Then the Rams won the NFC West. For a player who had never won more than eight games in a season, it felt like a jackpot. Johnson said he hasn’t changed much in his role as team captain — something he called “a big honor” — but Johnson has been asked to carry a big load in the secondary this season. Kayvon Webster, the Rams’ other starting cornerback, missed two games in September with a shoulder injury, then tore an Achilles tendon three weeks ago in the game against Philadelphia. Johnson already drew the assignment of the opponent’s top receiver, but now, with Webster out for the season, it’s imperative for Johnson to thrive. The pressure is on, particularly as the Rams prepare for the playoffs, but Johnson said he’s having more fun than ever before in his NFL career. The Rams appear to be set up for long-term success under McVay, but this coming offseason will include a lot of decisions regarding impending free agents, particularly in the secondary. Johnson’s contract is up and Webster has one year remaining, but it’s not yet known whether he will be ready for the start of the season. Starting safety Lamarcus Joyner also is set to reach free agency and the Rams would like to bring him back, and of course, lineman Aaron Donald’s contract situation still looms. It’s still possible the Rams could come back to Johnson, who won’t be eligible to sign with another team until March. Asked, directly, if he thought a new contract could be worked out with the Rams, Johnson smiled. Linebacker Mark Barron, who missed last week’s game with an Achilles injury and won’t play in Sunday’s season finale against San Francisco, isn’t a sure thing to return for the playoffs, McVay said. Barron did not practice this week and is on the list of players who will sit out Sunday’s game. McVay said he values rest for some of his players over the possibility of claiming the No. 3 seed in the NFC bracket. Quarterback Jared Goff, running back Todd Gurley, receiver Cooper Kupp, offensive linemen Andrew Whitworth and John Sullivan, Donald, Barron and linebacker Alec Ogletree will not play, and McVay hinted that players such as offensive lineman Rodger Saffold and receivers Robert Woods and Sammy Watkins would receive minimal playing time.